“Vicarious Trauma: Collecting the Herd” is written in a first-person narrative style in line with Indigenous ways of knowing and disseminating knowledge, as seen in the works of Campbell (1974), Koebel (2007), and Devine (2010), among other Métis scholars, writers, and activists. This piece opens with oral testimony from a Cree-Métis Elder Rose (pseudonym) recording during the SSHRC project “Tracing Métis History through Archives, Artefacts, Oral Histories, and Landscapes: Bison Brigades, Farming Families, and Road Allowance People,” and is one among hundreds of oral testimonies collected by me, Dr. Carolyn Podruchny, Yvonne Richer-Morrissette, and Blanche Morrissette during the summer of 2013. The tone and content of the interview has been kept in its original form, with some adjustments in style to make it readable in narrative form. Using a writing technique similar to anthropologist Paul Farmer’s article, “On Suffering and Structural Violence: A View from Below,” (2009) wherein he shares personal stories from Haitians who suffered trauma from state violence and grinding poverty, “Vicarious Trauma” similarly centers on impactful biography to reveal a deeper understanding of Indigenous history and research on historical trauma. This work demonstrates how researching historical trauma can adversely affect Indigenous and non-Indigenous scholars alike. The title “Collecting the Herd,” speaks to the decolonizing of Indigenous history implicit in the hearing of, documenting, making sense of, and healing of historical trauma within Indigenous populations. The listening of such traumatic narratives has been called the “hearing of the truth,” as it is known within the Truth and Reconciliation Commission’s Residential School Survivor testimonies, but it certainly extends to unrecorded Indigenous histories, forgotten by orthodox Canadian history (Weiss, 2015). Moreover, the work of collecting oral history and attempting to heal through cultural reclamation (burning of sage, ceremony with ancestors—the bison skull, and the “re-righting” of history, referred in this piece as “collecting of the bison herd”), is a reversal of the Christianization of Indigenous peoples, deployed by church and state over the last four hundred years. This process was known historically as “collecting the [sheep] flock.” In reabsorbing Indigenous “souls” into the bison herd away from Christianity, the decolonization of history can take place. Rose’s story is only one of the dozens of stories I’ve encountered in my field research in the area of historical trauma within Batoche Métis populations, and every one of them stays with and traumatizes me as I imagine what life was like for my people after 1885. During my early research, I could deal with the emotional pain that came with the stories about my ancestors and the road allowance, as it helped me to understand why I was plagued by the effects of intergenerational trauma throughout my life. But my ancestor’s stories linger and revisit me and harm me as they are trying to be remembered. I now find it difficult to read about “Sir” John A. Macdonald’s starvation policies, the subjugation of the Plains Cree, and the plight of the Métis over the long century; and I find it hard to talk about how I feel because most people just don’t “get” how traumatic it is to listen to the vivid stories of people like Rose, and most people aren’t haunted by their ancestors like I am. My current solution to releasing my ancestors’ trauma is the same as when I began my research: I write history that deconstructs the heroic settler histories Canada uses to justify what actually happened in the prairies to displace Indigenous peoples, and then I broadcast my arguments in essays, lectures, and conferences. But I never write or talk about the most traumatic of these stories. I feel as though I don’t have the right to. Instead, those narratives are buried within my soul. Locked away from prying western institutional eyes, they swirl around my mind and pull me down into the ocean of colonial trauma of which I am charged with making sense and somehow supposed to make right. 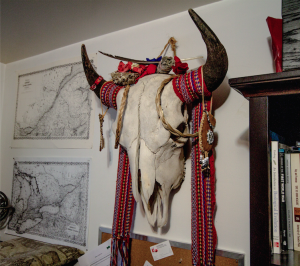 When the stories of my ancestors become too burdensome, I burn a smudge and whisk the rising sage smoke over Mistawasis—my bison skull that I keep over my desk for protection and courage in my work—and I pray I can make sense of what I am researching. Sometimes I imagine myself walking with Mistawasis in a giant herd of bison where he is leading me to our injured and lost ancestors whom history has forgotten or misrepresented. I pick them up and listen to their sorrow then lead them to better grazing pastures—the stories from these ancestors usually go silent afterwards, becoming distant, then inaudible. Other times, I imagine Mistawasis taking the injured souls of our ancestors back to Creator after I’ve discovered them fallen in the tall autumn grass; these spirits are released by a combination of unorthodox historical prose and smudge smoke which carries them towards the big sky, never again to mar my mind. But some souls are just too damaged to salvage or rescue. When Mistawasis and I encounter these kinds of spirits we stand guard and watch over them and wait for the prairie to slowly digest them while we bat away scavengers who try to steal what life-force remains of them—the stories of these tormented souls never leave me; my medicine, it seems, is just too weak to help them. Over the past two years I have been admitted to the hospital twice with intestinal issues. My health flare ups always strike when I am most engaged with my research on trauma. The first time “it” struck was two years ago while I was writing Archives as Good Medicine for a conference in Winnipeg; during which time my body seized up for seven excruciating days. A similar situation occurred while I presented for the Homeless Hub on the impacts historical trauma has on Indigenous homelessness. Afterwards, my side began hurting as it had in Winnipeg but this time it was much worse. The pain persisted and I was rushed into emergency surgery. I was bedridden for one week and stepped back from my work on trauma to reduce stress and help with the healing process. I have since recovered. I have sought council from other scholars who deal with intergenerational trauma and they have described similar effects to me. Some have had serious mental breakdowns and have been side lined from academic work for up to a year. Some have become so emotionally unstable that they quit school with thousands of dollars and hundreds of hours of work on the line. Of those who seem to deal “somewhat” with the trauma, many have taken up some sort of rigorous exercise regime, started running marathons, lifting weights compulsively, or religiously practicing hot yoga five days a week. Others have gone into psychotherapy, sought the advice of Indigenous Elders, or have come to rely on psychotropic medication. But most, like me, do not have any support; instead, we have to let the spirits of colonialism haunt us as we write history until stress fells us with some ailment for which there is no apparent medical explanation. And until there is a safety net that helps researchers and historians deal with it, I guess I’ll keep burning my smudge and walking with Mistawasis as we work to find those scarred and forgotten indigenous souls, those lost from the herd—even if it kills me. Jesse Thistle is Métis-Cree from Saskatchewan and a master’s student in history at the University of Waterloo. He researches trauma and memory within populations of Métis and Cree in Northern Saskatchewan. His work is directed towards community healing and cultural reclamation as well as retrieval of oral history archives, challenging orthodox settler histories in the narrative of Turtle Island. Campbell, Maria. Half-breed. Toronto: McClelland and Stewart Limited, 1974. Keobel, Jamie. “My Story: Reflections on Growing Up in Lac la Biche,” in The Long Journey of a Forgotten People: Métis Identities and Family Histories. Ute Lische and David McNab eds. Waterloo: Wilfrid Laurier University Press, 2007. Devine, Heather. “Being and Becoming Métis: A Personal Reflection,” in Aboriginal and Fur Trade Histories: Gathering Places. Carolyn Podruchny and Laura Peers. Vancouver: UBC Press, 2010. Farmer, Paul. “On Suffering and Structural Violence: A View from Below,” Race/Ethnicity: Multidisciplinary Global Contexts 3, 1 (Autumn , 2009) 11-28. Jesse, many, many thanks for this brave and honest post. The burdens of listening and living with stories can be great but know you are not alone! Thank you once again for sharing your experiences. Yes, the need for a support network for scholars and researchers who work in the field of historical trauma and memory is long over due. Thank-you for writing this important and brave article Jesse. I agree with your comment aboit the need for a support network.